Acknowledged author Benjamin J. Sadock wrote Kaplan and Sadock's Synopsis of Psychiatry: Behavioral Sciences/Clinical Psychiatry comprising 1472 pages back in 2014. Textbook and etextbook are published under ISBN 1609139712 and 9781609139711. 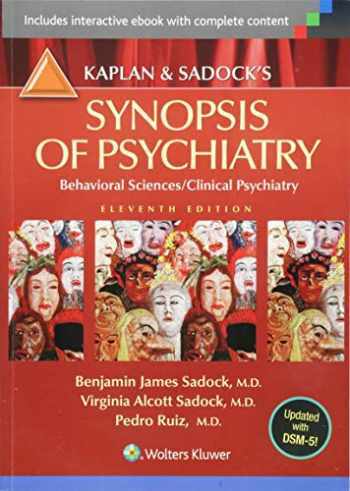 Since then Kaplan and Sadock's Synopsis of Psychiatry: Behavioral Sciences/Clinical Psychiatry textbook received total rating of 4 stars and was available to sell back to BooksRun online for the top buyback price of $35.37 or rent at the marketplace.